We love how the blocks are pushed to the quilt’s edge in this design—there’s something quietly bold about it. 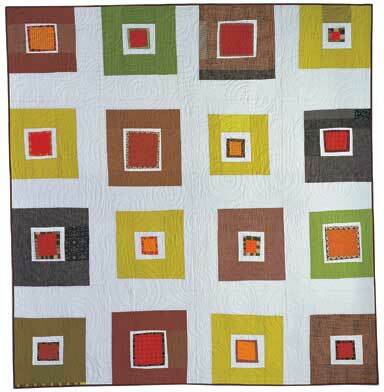 We also like the play of the hand-drawn swirl quilting against the not-quite right angles of the blocks. Denyse was heavily into old-time music (not to be confused with blue grass) the year she designed this quilt—which definitely influenced the name. The palette of Lazy Gal feels very traditional yet modern at the same time—a wonderful contradiction that is a hallmark of Denyse’s design style. If you love this design but the Couture quilts are out of reach, you’re in luck—"Pretty Square" (a version of Lazy Gal) was designed by Denyse for her Sarita Handa collection. For the discerning collector, Lazy Gal is still the ultimate choice.